Great theatre generates a broad range of human emotion. An audience should experience everything from laughter to tears, compassion to joy, despair, giddiness, introspection, revelation, unity and inspiration. Hoboken is fortunate to have a truly great theatre, one that creates all those emotions… and more. Following on the heels of “You’re a Good Man Charlie Brown,” Mile Square Theatre takes a decidedly more adult view of the world with “Betrayal,” Nobel Prize winner Harold Pinter’s masterpiece, presented in two acts. MST’s production of “Betrayal” has plenty of laughs, though it’s not a comedy. It also has plenty of wrenching moments, though it’s not a melodrama. It’s a sublime celebration of the complexities of adult life. You will leave electrified and renewed, filled with a greater perspective on your world. And probably in need of a drink. “Betrayal” explores marriage and infidelity among old friends Robert, Emma, and Jerry. Robert and Jerry are best friends who also work together, but an affair between one of them with the other’s wife creates a tense world of deception and mistrust. Legendary for its reverse timeline – like the movie “Memento,” but without the caffeine, violence or tattoos – “Betrayal” unravels the story and the origin of the raw emotions we see on stage. Director Chris O’Connor allows the actors to settle into their roles, giving them the room to become more relatable and more real than most characters we meet on stage and screen. He uses emptiness – the empty space between words, the empty space on stage – to fill let the actors, and the audience, fill in the details of each raw emotion and tense moment. 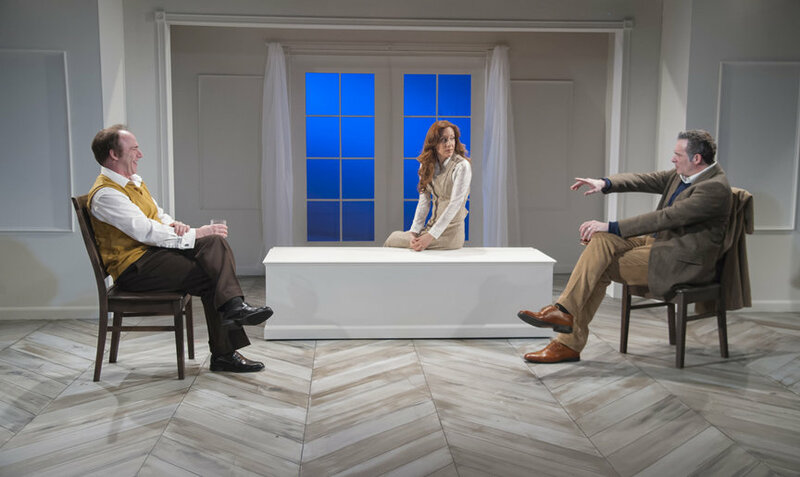 Emma (Dena Tyler), Jerry (Aidan Redmond) and Robert (Matthew Lawyer) fill the stage with their pointed, measured words and their comfort in the awkwardness of familiarity. Their every move rings familiar to those of us who’ve been in a relationship for longer than a few weeks and who know that what is not spoken is often more powerful than what is. Their performances should be used in acting classes to demonstrate the value of grounding, pacing and purpose. Their barely constrained passions and dry, sharp humor make each moment familiar and honest. They are us: while we imagine we’d react to shocking events with dramatic, over-the-top outrage, the truth is we’re more likely to restrain ourselves with alcohol, sarcasm, and a clenched jaw. In that way, the actors in Pinter’s play shows us just how British we all really may be. And they do so quite brilliantly. Matthew Fick’s set is, once again, a perfect complement to the performance on it, this time in its simplicity. The interior of a could-be-anywhere house is the foundation of scenes in homes and pubs across the British county side and throughout a decade. At times, the performers blend into their surroundings, only to pop out in the passion of the moment. Fick has created an intentionally blank canvas that Pinter, O’Connor, and the actors splash with the colorful moments of life. In short, if you aspire to theatre that takes a raw and emotional journey, that demands a bit more than just tapping your feet, that holds a witty and powerful mirror up to our own humanity, then Mile Square Theatre’s “Betrayal” is for you and yours. Just save time for a drink at the pub after the final curtain. “Betrayal” is presented by Mile Square Theatre, 1400 Clinton St., Hoboken, through April 23. Performances are: Thursdays, 7 p.m.; Fridays, 8 p.m.; Saturdays, 3 p.m. and 8 p.m., and Sundays at 3 p.m.
Tickets are available at www.milesquaretheatre.org, or by calling (201) 683-7014. Tickets are $30, $18 for students and seniors. Jeff Kreisler is a writer and comedian living in Hoboken and currently asking his friends if they’ve had an affair with his wife.